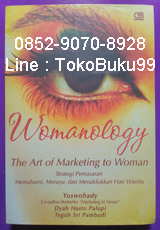 BUKU WOMANOLOGY, The Art of Marketing to Woman, by Yuswohady, et al. Build sincere emotional connection. Relate her with your brand. Link her with each other. She wants to be care and appreciated. Listen to her! Understand her! Woman is the most value-oriented creature. She will pay to get exactly what she wants. Offer to her a solution, not just a list of features. Be an empathetic brand. Touch woman’s deepest heart with your love and passion. Remember, trust is the most important emotion in a sale to woman. If you not trusted, you’ll never earn her heart.